The first time Kamil Stelmach stepped into public wearing his astronaut suit, he was stopped by a police officer. That incident marked just one small bump in the road for Stelmach’s potential future journey to space. “The inspiration itself came about ever since I was little. I am originally from Poland, and one of the first few books I had was in Polish. The title translated to, “Stars and Planets,” and ever since I read it, I was really excited about space,” Stelmach said. Stelmach’s inspiration led him to enter himself into Axe Apollo Space Academy’s competition to send someone to space. The competition is composed of two parts. The first is a sweepstakes where anyone can enter him or herself in hopes of being chosen in a random drawing of eight individuals to compete at a space camp. The second part is the voting portion, where individuals can choose to work and campaign for votes. The two top vote getters will also participate at the space camp, where one individual will be chosen for a chance to fly to space. Currently, Stelmach is ranked 20 out of more than 600 individuals. But according to him, he still has a huge hill to climb. “The top five people have over 10 thousand votes, and that’s mostly because they were kind of famous before the competition. They were famous YouTube bloggers,” Stelmach said. The two top vote getters currently have roughly 41 thousand and 35 thousand votes respectively, leaving Stelmach with a huge gap to fill, but he has not given up yet. “I am trying to tackle campaigning in stages. So, the first stage was my friends and friends of friends. Now, I am transitioning into where I am just going person to person but also trying to get some media attention,” Stelmach said. Stelmach’s campaigning also has a unique aspect that he uses to try to gain attention: a space suit. 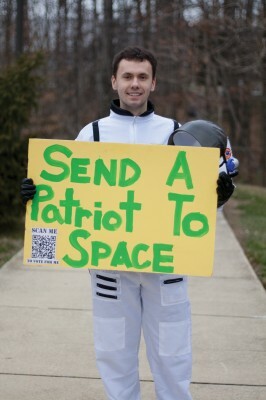 Purchased off of Amazon, his suit, complete with NASA-badges, helmet and backpack, help him to stand out while he walks across campus, DC and surrounding areas during get-out-the-vote efforts. Stelmach has also worked to strengthen his social media presence. 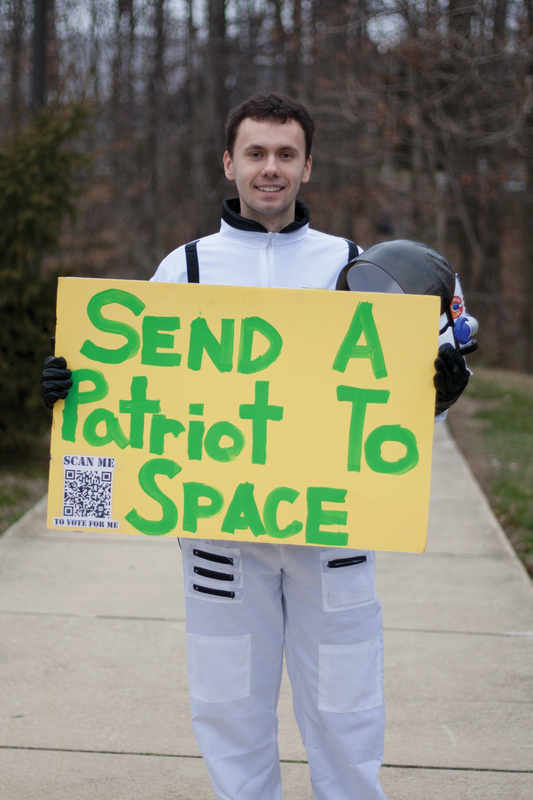 He has three Facebook pages: One specifically geared towards the Mason community called “Send a Patriot to Space” another aimed at University of Illinois where Stelmach received his undergraduate degree and another geared towards the public. Stelmach is also creating a kind of alter-ego, Kam the Astronaut, to help give his cause a brand name. “I know it’s a little slow right now, but at this stage, we are just trying to get to a thousand plus votes so I can be in the top 10 so people can spot me really easy. At that point, we can try to get some video out that might go viral,” Stelmach said. Despite being far off from securing the top spot in the competition, Stelmach has found plenty of reward from the process, so far. “I have been a little surprised by how people would be excited to support me. There were people that I hadn’t talked to in a while, even from high school, who had joined up and told all their friends so, that was really exciting, especially from the perspective of a lonely grad student,” Stelmach said. The competition stays online until Apr. 27, giving Stelmach time to build up a strong voter base, but he will need lots of help. Visit Stelmach’s Facebook page for more information and details on how to vote at http://goo.gl/2xkV3.